St Helens Council will be showing its solidarity with the family and friends of Len Saunders when it lights up the Steve Prescott Bridge on the evening of his funeral next month. As a tribute to popular local poet, actor comic and musician, Len – who was known by the nickname ‘Len Banana’ – the bridge will be lit up yellow on the evening of Friday 1 September, following his funeral service earlier that day at Lowe House St Mary’s Church on North Road. Len – who died in hospital on Sunday 30 July as a result of an incident which occurred in Ward Street on Friday 21 July – will be remembered as a kind-hearted, warm spirited person, who was very often the first face visitors saw when they came to Lucem House Community Cinema Plus+ in Corporation Street, where he volunteered. 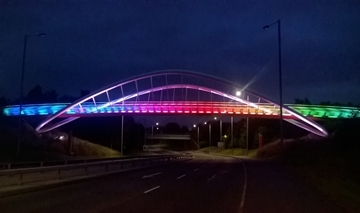 St Helens Council Leader Barrie Grunewald said: “The council will pay its respects to Len, a popular local resident who lost his life in tragic circumstances, when we light the Steve Prescott Bridge up yellow to remember the bright character he was. “There aren’t many places better than St Helens when it comes to people coming together to remember lost loved ones – and the Steve Prescott Bridge is a special symbol of that.